Instructions for the e.p.t. pregnancy test should come in the box with the product. If you're thinking of buying one and wondering how it works, here's a brief description, but you should still check the package before using this test. The e.p.t. pregnancy test instructions that come in the package are more detailed and will be up-to-date in case they've changed recently. However, you can get a good idea of how the product works with a general guide. The e.p.t. pregnancy test comes in two versions of the standard urine test. The original home pregnancy test has a stick that you hold in your urine stream and a round window that shows a plus or minus sign. The newer version has a digital screen that shows "Pregnant" or "Not Pregnant." The e.p.t. pregnancy test instructions are easy to follow. Start in the morning. You can use the e.p.t. test as early as four days before your period is due. However, results are less likely to be accurate early in pregnancy. To help increase your chance of getting an accurate result, use the test as soon as you wake up, the first time you urinate. The test measures the pregnancy hormone (HCG), which is most concentrated first thing in the morning. Get Ready. Take the test stick out of the package and remove the purple cap. The stick has an indentation for your thumb; hold the stick at that end, opposite from the absorbent tip. It doesn't matter if the results window is facing up or down. Collect a urine sample. You'll need to dip the test into your urine, which can be done by using a clean cup to catch your urine or holding the test directly in your urine stream. If you don't want to look at your urine or don't want to have to dispose of the soiled cup, hold the stick in the stream while you urinate. Wait. Now place the test stick on a dry, flat surface and leave it alone for two minutes. Shaking the test stick or moving it around can affect the result. Check the results. After the two minutes are up, check the results window. If the results are not clear, wait another minute or two and check again. Don't wait too long to check the results because they may be less accurate after ten minutes have passed. A plus sign in the round results window means you're pregnant. A minus sign means you're not. Either way, a line appears in a smaller, square window to let you know you've done the test right. If it doesn't, check the package instructions. You might not have done the test properly or the test stick might be faulty. Don't take these results as the final answer, though. If you think you're pregnant and the test doesn't agree, wait a few days to a week and try again. If it's still negative and you haven't had a period, see your doctor. Check with the doctor, too, if the test is positive. You'll need to confirm that you are pregnant and start the appropriate care. Instead of a plus or minus sign, the results window shows "pregnant" or "not pregnant" in plain English. The test comes in two parts: a holder with a digital readout window and a separate test stick. A symbol flashes in the results window to let you know the test is processing. If there's a problem with the test, the readout shows an error message. Take the holder and the test stick out of the package. Align the purple arrows on the test stick and the holder so they're pointing at each other. Insert the test stick into the holder until it clicks. A small image of the assembled test kit should appear in the results window. Just like with the older version of the e.p.t. pregnancy test, you'll need to dip the absorbent end of the test stick into your urine. Again, you can use a cup or hold it directly in the urine stream. Check the package to see how long you need to soak it. If you've done this step right, the symbol in the results window should flash. You might not have used enough urine. You might have separated the test stick from the holder too soon. The test might be faulty. Check the official e.p.t. pregnancy test instructions to see what to do next. As with the older version of the test, see your doctor if the test is positive, if it's negative but you haven't had a period, or if you have signs of pregnancy or any other concerns. You can find more information on the e.p.t. pregnancy test website. 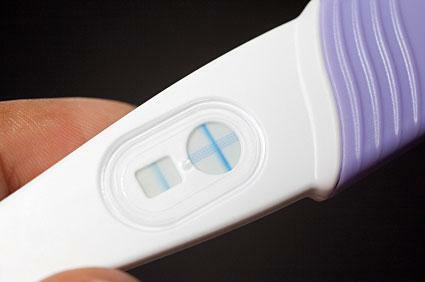 Home pregnancy tests are becoming easier to read as manufacturers make new developments. No matter what the results are, it is important to follow up with a visit with your doctor. A medical professional can confirm or negate test results and it's a good idea to let your physician know that becoming pregnant is a concern.